This January (2004), while I was at the Issels Clinic of The Oasis of Hope Hospital in Tijuana, Mexico, I had the great fortune to meet one of the most courageous people I have ever known, Tamra. She has been suffering from Neurofribromatosis Type 2 (NF2) since she was a very young girl. The disease, and the surgeries to fight it, have left her partially disabled. As far as I know, there are no conventional treatments for her disease. Life consists of one trial after another as tumors grow and have to be removed. Brain tumors, arms, legs, you name it. I can't begin to imagine the horror she must have been going through on a daily basis. Still, she is obviously a fighter. She puts her trust in God and she is not disappointed. From very early on in the Issels treatments, she seemed to be experiencing some improvements. She was glowing (whether she knew it or not) and was a real inspiration for the other patients. It’s hard to sum up the long and hard fight I’ve fought through the years, having been diagnosed with Neurofribromatosis Type 2 (NF2). NF2 is a disease known for inflicting a person’s central nervous system with tumors. The tumors attach themselves to the nerve, gradually crushing it. I was diagnosed with this inflicting disease when I was 9 years old. I’m now 21 and tumors have invaded my body for 12 years, resulting in 8 major surgeries in the last 8 years in which I have lost total hearing, sight in one eye, facial movement, and impaired balance. I go through extensive rehabilitation after each surgery to get back some of what was lost. Despite the trauma my body has been through, God has proven Himself faithful time and time again and I’ve always been able to trust His hands even when I don’t fully understand His plans. I didn’t start having major problems until I became a teenager and the acoustic neuroma tumors started growing. My first surgery was performed when I was 12 years old at Johns Hopkins Hospital by Dr. Ben Carson(author of Gifted Hands). My family and I flew there and I had a tumor removed off my spine. Two months later I went back and another tumor was removed off my right eye. I had almost lost total sight and my doctor was hoping to regain some back upon tumor removal, but the tumor had already crushed my optic nerve causing total blindness in my right eye. Two weeks after surgery I started my 7th grade year. I was able to work my way through Jr. High and the first part of High school with no other problems, defying the learning disability that some NF2 patients are inflicted with. God has given me a very bright mind, having no mental problems to deal with and always making straight A’s. I began my junior year in high school but only two weeks after starting, I started having excruciating headaches that caused me to have all kinds of emotions. I couldn’t go to school because I was always tired and constantly felt bad. It was becoming harder and harder to walk and my balance was awful. It was discovered through and MRI that there was a tumor on my brainstem the size of a lime. Immediate surgery was needed to remove this life-threatening tumor. On October 1, 1997, a twelve-hour extensive surgery began to remove the tumor that was entwined with nerves. Much prayer was needed. The teachers in my school and my youth group started fasting days before the surgery. The Lord moved in such a way in my school, classes were being altered and many giving their hearts to Jesus. There was also prayer in the surgery room because my doctor received approval for Jeff Fenholt to pray IN the surgery room. Jeff Fenholt was the leader of Black Sabbath and Jesus Christ Superstar, and his life was dramatically changed upon accepting Jesus into his life in 1979. His taking 12 hours out of his busy schedule for a teenager he never knew makes him hold a special place in my heart and a deep friendship. The surgery was very successful, removing the entire tumor except the part hooked to my facial nerve. I spent 36 days in the hospital and had to learn how to completely walk again. I also lost movement on the left side of my face. My mom stayed with me during the days and nights. My dad and brother would spend the weekends and days off with me. Whenever my spirits were low, my mom would turn on praise and worship music and it would always help. The psychologist would always ask why I was in such a good mood and not depressed (like everyone she saw was) and I would tell her that I just turn on praise and worship music to uplift me. The overwhelming amount of visitors was much needed and really helped during my lengthy hospital stay. Rehabilitation was very long and hard but I’m more then a conqueror through Jesus who gives me strength. I was able to graduate high school on time with high honors and started college. I’ve completed 35 hours of college classes but in December of 1999 I went to Los Angeles, CA for a tumor removal and the placement of a life-changing new technology, the Auditory Brainstem Implant (ABI). The ABI is much like the cochlear implant except that the ABI attaches to the brainstem since NF2 takes the cochlea nerve. It sends signals straight to the brain, producing a response that can be interpreted into words. I had tests done that showed the ABI was working but since I still had hearing, I didn’t see the full effect. In April 2001 I was told that I would lose total hearing due to a large tumor on my only-hearing ear. Upon hearing the news that I would become deaf I was distraught because people haven’t been educated properly about the deaf culture. I researched deafness and sign language the whole year and was encouraged but wanted to put off surgery until after my brother’s senior football season in which he was the star linebacker. In December 2001 I had put it off long enough and was battling the affects of the tumor that caused my balance to deteriorate and my voice to become soft. So a week before Christmas I had the tumor removed in Los Angeles. I had to have a feeding tube for 2 months because of the tumor pressing on my throat, auditory nerve, brainstem, and facial nerve. I lost total hearing but on Christmas Day while lying in a hospital bed, I put on my miraculous ABI and I could hear. It was my Christmas miracle. It’s not normal hearing but I’m hearing through the help of lip-reading, and it has continually gotten better through the year. I am so thankful for my ABI and the ability to hear again. I also lost the movement of the other side of my face because of the damaging tumor. My doctors said it would return in time and it did nine months later but that was very hard to deal with because I love to smile and am such a happy person that I want to express God’s love. Having been in California for Christmas was not easy but my family and I made the best of the bad situation. We were overjoyed to be able to be home this year to celebrate Jesus’ birth with our friends and family, something so many of us often takes for granted in life. Just being in California away from my friends was also hard. My loving pastor and his wife flew out for both of my surgeries. Going into surgery is always hard for me to think of my family having to sit there and wait. Them being there to lift up my family and me when we had no one else encouraged and blessed us deeply, and they’ll always hold a special place in our hearts. In May of 2002 I was told the large tumor behind my knee needed to be removed since it was cutting off the circulation in my foot. After removed I was able to walk into my brother’s graduation the next week, something that astonished friends and family. A few months later I started having pain in my shoulder but just thought it was from working so hard in rehab. In Nov. 2002 a tumor was discovered on my upper spine and was removed thereafter. I’m recovering very well right now from that. I was very thankful to have both of these surgeries done close to home by my very experienced and loving doctor. God has always blessed and guided me to the best doctors and therapists, so I’ve always been well taken care of. My family is very close which has been such an asset. We’re very strong and lift each other up, totally putting our trust in God to guide us through the obstacles we face. Through my battle with NF2 God has given me such a will to live and the strength to press on to the finish line in my life’s race. I have a goal to return to college and obtain an American Sign Language degree. I can’t get through any of these trials without the overwhelming support and encouragement of friends and family and God’s arms around me, carrying me every step of the way. Life is so very precious. We never know when today is our last, so cherish and never take for granted friends and family, while constantly walking in His light. He will carry you and He will make a way where there seems to be no way in a situation that seems impossible. Despite the fact that I still have multiple tumors that could grow, I know that my God is greater then any situation and is continuing His work in me. My miracle is on its way because God is Always Faithful! I'm so excited about my progress and want to get the word out. I meet NF2 patients all the time when I go to LA for my hearing implant programming and I can't wait to be able to share with them this new treatment that is and will get rid of the NF2 in my body. Before I came to Oasis, I was facing another surgery because a tumor on my wrist was causing my hands to do almost nothing. Now almost all the function in my hands is back! It's so AMAZING and i'm constantly looking at the tumor on my wrist shrink. When I do stuff with my hands that I couldn't do before, I just stand in awe. My balance and walking had gotten worse through the years because of the damaging tumors and many surgeries. My balance/walking are getting better-it's just a slow-go because of all the damage but i'm noticing change!!!!! The first month I was home after Oasis, I was totally exhausted from the dendritic vaccine but Gar said to take a week off because they didn't want me worn out all the time. Last week was my first week off and I felt so good and was able to do more . I felt better this week after the vaccine too, due to a week of rest and no vaccine. Exhaustion is my only one [side effect] -I got a fever a couple times. I'm doing so good and feeling better daily. Hope your good! ·January 19-I was able to pinch my hair clippy. would just curve. Today my pinky moved straight and pointed. fingers together for months and today it was able to. shrinking. I turned the key in the very hard lock. been very difficult to do for 6 months. ·February 5-The tumor on my right wrist has shrunk a couple inches. been able to do that in 6 months. haven’t been able to do in 6 months. ·February 14-I am able to step up 1 step straighter and steadier. whites in my eyes whiter. feet are also closer together when walking. I hope each of you is doing well. I wanted to update you on how I've been progressing with treatments. I know it's been awhile but I have a good excuse. I've started back to college where I'm learning sign language! It's been over 3 years since I've been in a class setting. Being able to continue working on my degree again has been such an amazing accomplishment. It was extremely hard on me at first because this is the first time I've been to school deaf. For the past 3 years I've been working on getting my body working right and this is working your mind, hands, and eyes. It's been a physical and emotional challenge since the first day, but I've continued on because I just really need to do this for myself. For me its more then just learning sign but also learning about this new life I have and how to live and feel comfortable with it. Sign language is a very hard yet interesting language. I went to my first deaf social and it really encouraged me to see the deaf community interacting and living in this hearing world. I'm continuing to progress with the treatments and constantly in awe at my accomplishments. I'm doing stuff now that I haven't been able to do in a long time. 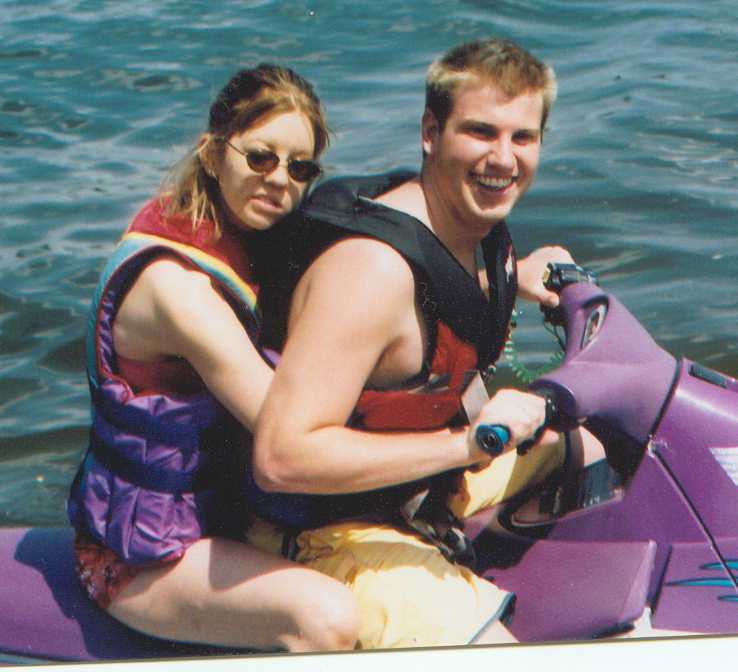 This summer I rode a jetski and a boat, which I haven't done in 10 years. Since I started treatments that have resulted in improvements, I've talked about heading up the mountain instead of down. 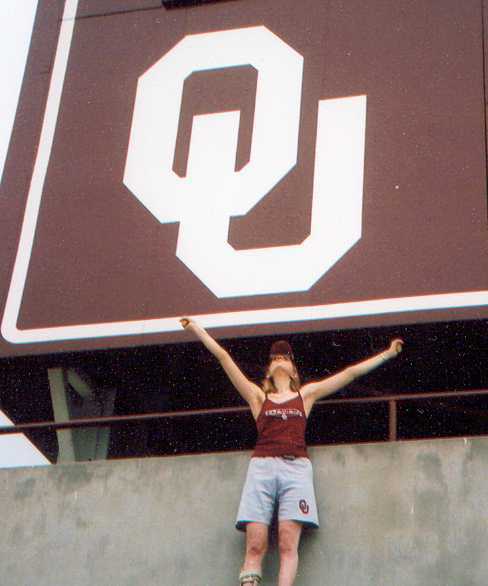 So on my 23rd birthday I headed up the OU stadium and stood at the top VICTORIOUS!!! God is good! It was an amazing feeling to know I did and could do that because a few years ago at a game I had to have a lot of help. Last year at this time I could do almost nothing with my hands but now I'm learning sign and doing the small everyday things that are so often done unconsciously. The tumor on my wrist and others are continuing to shrink. My doctors are excited and encouraged with my progress. They are amazed at how well my body is fighting and that the tumors aren't growing. For 12 years the tumors have been active and damaging my body but through the treatments my body is constantly fighting to reclaim itself. Incorporating weekly vaccines and IVs into my school schedule has been hard because I've had no time for myself. Right when school is over for the week it's time for vaccine shots and the recovery that comes with them. However my body is adjusting better to this routine and the changes it's undergoing. At times it's still been hard but worth it because of the amazing changes I'm seeing. I've been on the treatments for almost a year and now have more energy, tons of improvements, and 500 shots to show for myself. My trip up the mountain has had a few bumps but I've just had to continue on because God has constantly shown Himself real and in control. God has instilled a determination in me to move onward and forward one step at a time, resting in His arms to strengthen and get me through. I can't thank you enough for your prayers. Keep them up because they're truly getting to the throne room. As we enter the holiday season hold tight to the blessings and miracles all around you. God is so good and constantly working in our behalf, even if we don't see it at the time. God bless you Always! "He gives strength to those who are tired and more power to those who are weak. I wanted to update you on how I've been doing on this road to total restoration. I finished my first year back in college in May. I learned so many signs and so much more about the deaf culture. I just went back and will continue to work hard to obtain a degree in sign language. I've been continuing the vaccine treatments for a year and a half and am feeling better then I have in a long time. My energy and stamina have really improved. My body is accepting the vaccines so well and I'm just really improving in everything. I continue to watch the wrist tumor and others shrink. In fact in the doctor's report a month before I started treatments, my hands were described as "claw shaped" and the wrist tumor measured at 6 inches. It is now 1¾ inches long! God is good! The doctor recommended surgery but said my hands were so bad that I wouldn't regain any function. I just finished a year of signing and using my hands daily to do it! Also I'm continuing to notice improvements in everyday tasks that we do so unconsciously. The MRI I had done last month showed no new tumors have formed and the ones I have aren't growing! That in it self is a huge miracle since the tumors grew rapidly for 5 years causing 5 surgeries. During my California trip last month for my annual ABI (hearing implant) tuning, I saw a doctor about my vocal cord paralysis. My paralysis, from a surgery 3 years ago, has caused my voice to be soft, a choke when I eat, and too much oxygen being pushed out when I talk. He recommended a surgery called thyroplasty that will push the vocal cords together, giving me a stronger voice and help me not to choke or push air out, I'm very excited about this surgery because its just another step in getting back what the tumors have taken. My surgery is scheduled for September 1 in Los Angeles. The surgery is 2 hours but I'll be staying in town for 2 ½ weeks to recover. Please keep me in your prayers for a successful surgery. God has done so much to get me this far and this treatment has been truly life changing for me. I recently went back to Oasis Hospital to have another set of vaccines made and my blood cleansed. The doctors were so pleased at my progress and very happy that my body is accepting and doing so well with the treatments. I'll continue the treatments as long as the tumors continue to shrink. I truly appreciate your financial and prayer support-it means so much. My heart overflows with gratitude for all that you can do but most importantly, continue to keep me in your prayers. Please specifically pray for the circulation in my legs. The tests I've had done show the blood's flowing good but my legs are heavy and purple. Believe with me that God will complete His healing work in me because I've had a few bumps in the road but I truly can see the finish line! I feel better then I have in a long time. I feel like more of Tamra is coming back! Life is good! PS. I wanted to add a tid bit- I'm a very proud big sister of an Edmond firefighter! Lance has been working hard for 3 years and recently obtained a paramedic degree. During that time he tried out for fire departments and from Jan-March went through the hiring process. 500 started trying out but only 7 were hired. He went through 9 physical&written tests and interviews. He was hired in March at Edmond. He's been in the fire academy this summer and will start in Sept. Lance also got engaged during the spring and is planning for a summer 2006 wedding.